Take a stroll through your local shopping centre and you’re bound to find the image of a majestic tree often enclosed by an elaborate circle adorned with intricate details. It’s not unlikely that you might even have this symbol somewhere in your home, in your closet, or perhaps even on your body in the form of a tattoo. More than just a decorative stamp to add on to your favourite personal possessions, the Celt symbol holds a greater, deeper meaning than many of us are likely to know. Find out more about this mysterious symbol, its roots, and its meaning with this guide on everything you need to know about this significant Celt symbol. While the beginnings of the Celtic Tree of Life remain unclear, carvings that depict this symbol have been found along walls and ornaments dating back 2000 BC. Most of these artefacts were found in northern England, although it has appeared in many other locations throughout the world. This leaves experts with one conclusion – the Celtic Tree of Life holds a meaning that hundreds of different cultures accept and believe. According to folklore, ancient Celts who called it “crann bethadh" honoured the tree by clearing out a vast field and leaving a single tree in the centre. It was under this that they would come together to meet, make decisions for their community, and appoint leaders and chieftains. People continue to wonder why the tree was chosen by the Celts as the ultimate symbol of existence and wisdom. Take a look and it becomes apparent just how nurturing these silent natural entities can be. A tree provides shade and protection from the harsh heat and rain. Trees that bear fruit can also provide nourishment and sustenance to those around it – both human and animal. The structure consists of countless branches that spread out around it, reaching farther than most of the other growths that surround it. Finally, they are a strong form of shelter for numerous animals and insects seeking protection from the elements around them. Taking all of these factors into account, it’s no longer hard to see why the tree has been chosen as the best symbol of life, continuity, strength, and wisdom. Today, there are lots of different versions of the Celtic Tree of Life, but there are some characteristics and details of the symbol that are constant throughout all versions. The biggest and most significant part of the symbol is, of course, the shape itself. Oftentimes, the tree is set in a vast, open field that symbolises all the world – both seen and unseen. Finally, the tree and field are enclosed in an elaborate circle, symbolising the continuity and consistency of life. Although this is the typical and traditional way of depicting the tree, there are countless other versions. Some people choose to draw out the tree as a simple structure enclosed in a sphere. Others choose more elaborate designs, incorporating even small mythical, mystical creatures to represent the lives around the tree. If you’ve ever heard the story in the Book of Genesis, where Eve eats a piece of fruit from the Tree of Knowledge, you probably already have an idea as to what the Celtic Tree of Life means. This elaborate symbol was developed to represent the connections between heaven, earth, and hell. It symbolises all life as they bear fruit and give nourishment and sustenance to those around it. But that’s not all that this symbol means. Lots of different meanings are given to this symbol, and it depends on the person looking at the tree to decide which one suits the symbol best. Rebirth is one of the most common alternate meanings for the Tree of Life because a tree experiences renewal throughout the seasons, with its leaves falling in autumn, and regrowing throughout spring. Wisdom and strength are also commonly accepted meanings. Often depicted as stoic, large, and heavy, it’s age is seen as a worthy source of wisdom, knowledge, and strength. In the past, this symbol was seen as the doorway to heaven and hell, with earth as the middle ground. This is why many often associate the Tree of Life with balance and harmony, allowing all three facets of the world to coexist in peace. This particular version depicts the tree in an endless knot with each branch connecting to a corresponding root, thus making it a closed structure. This is often regarded as a much more specific representation, better depicting the continuous cycle of existence on earth and how such existence is unstoppable, constantly dying and renewing. Oftentimes, this particular version is seen as pendants and decorations. 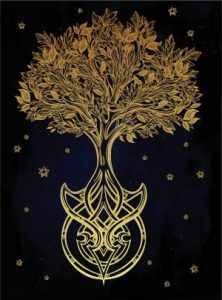 The Celtic Tree of Life was such a powerful and prominent symbol of strength, wisdom, and life in the past that it has retained this image in the present. While there are very few who still regard this as having magical, mystical powers, there is still a large population that appreciates the meaning and representation the symbol holds. These days, it’s not uncommon to find tapestries, decorations, or even tattoos depicting the life tree. While those who patronise these products might not actually hold as strong a belief as those who first developed the symbol, it still goes to show just how influential and prominent the Celtic Tree of Life is to this day.